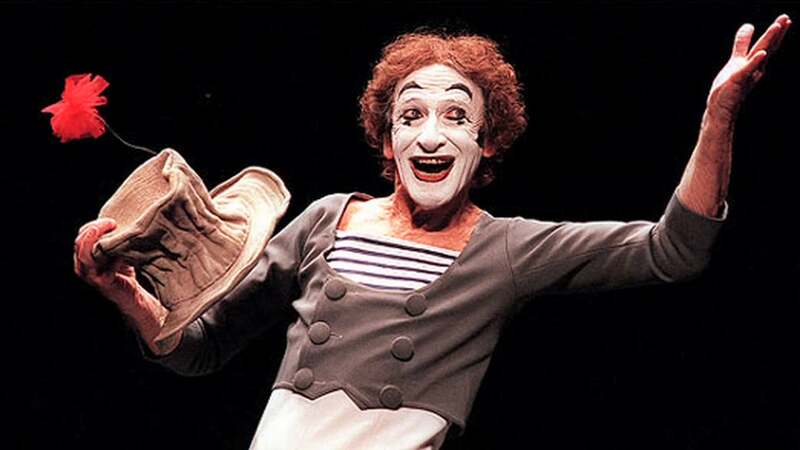 Marcel Marceau is probably the most famous pantomimist in the world. Years ago he had a funny bit in the Mel Brooks movie "Silent Movie" where he actually speaks. Why am I talking about a pantomimist in a column about job interviews? Because today I felt like I was interviewing a mime (pantomimists are referred to as mimes). Recently, I have been interviewing candidates for some Data Analyst positions in my current project. Today's experience was, I hope, unique. I share here with you now so that you can take note and make sure that you nail your job interviews instead of blowing it like this guy did. This was a simple, 30 minute phone interview to screen candidates for a longer virtual interview with a team of interviewers. I used the first eight minutes or so to explain the program and the position and then I launched into the meat of the interview - the candidate's experience. Me: "Tell me about your experience doing data profiling and data cleansing." Him: "Yes. I have done that." Me: "Tell me about what kind of problems with data you have uncovered while doing data profiling, how you found them, and what you did about them." Him: "Yes. It is common to uncover problems like missing data and bad data during data profiling." Me: "Well, okay then. I think I have all the information I need. Do you have any questions for me?" Him: "No. I don't think so." Me: "Okay. Thanks for taking time to talk with me. We'll be in touch." Click. We were done and off the phone in about 10 minutes and in 30 more seconds I had fired off an email to the recruiter saying "Pass" on this candidate. I am really hoping this guy heard the job as I described it and decided it wasn't a good fit. However, rather than giving such a terrible interview, I would have appreciated a candid remark like, "This really doesn't sound like something I want to do. Please remove me from consideration for this role. Thanks." My fear is that this guy is really this bad at interviewing. Just so you know, when an interviewer like me asks you to talk about your experience, I am expecting you to tell me what you have done and for whom. Even if you give me a quick synopsis or overview, that is fine (in fact that is great). I can then pick where I want to dig deeper. While it is true that long answers can be deadly in an interview, really, really short answers in interviews are not a good idea. They don't showcase your skills, which is what you want to do to get an offer (or a follow up interview). My favorite interviewing book, "Killer Interviews" by Ball and Ball, advises that you keep your responses to no more than 2 minutes long. Tom Sheppard has been hiring, firing and coaching job seekers for decades. He is the author of Tips and Tricks for Effective Interviews and several other books for job seekers. You can learn more about Tom on his Author Page. (C) Copyright 2016 Thomas K Sheppard and A+ Results, LLC. All rights reserved. Okay, here is another quick chapter in the ongoing saga of resume faux pas that I see as people apply for PM roles with me. Today, I got one that I hadn't ever seen before. Which is really pretty amazing to me considering how many resumes I have seen over the years. What was this noteworthy mistake? Under "Key Achievements" which an applicant listed he noted "Developed technical expertise" and "Developed a background understanding..."
I don't know about you, but I admit freely that unless an engagement show signs that it will help me develop or grow in some way, I am not overly eager to take it on. So what I learn in and engagement is important. To me. A prospective employer doesn't care a whit about what I learned in a past engagement. What they do want to know is what I did that benefited my past employers. If your resume reflects a WIIFM (What's in it for me?) attitude, chances are good that, like this guy's, your resume will end up in the trash instead of doing what it should do: getting you an interview. The dance between job seeker and prospective employer is one where both side tries to present their best face and make themselves as attractive to their dance partner as possible. 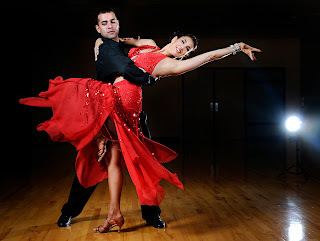 Don't step on your own foot by crowing about how you benefited from a past dance partner. Instead, show them how you applied your knowledge to get results for others which you can also do for them. As a veteran of the USMC I take serious exception to people who claim veteran status, or claim to have served in certain units, or been given certain military awards, which they didn't actually earn. 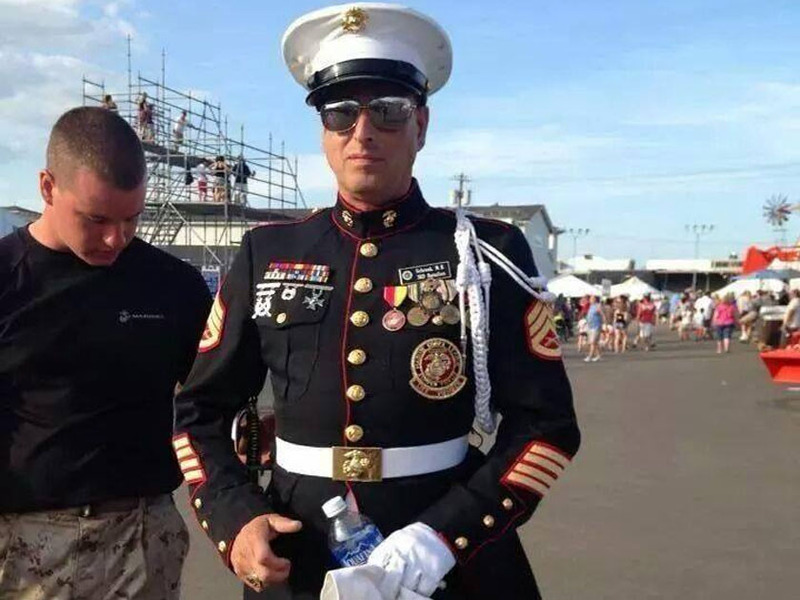 The picture above, as cited on the website TaskandPurpose.com, is Michael R. Schrenk, 47, dressed as a laughably poor fake Marine, next to a real Marine at the Erie County Fair. Feel free to follow the link above to see why they called him "The Worst Fake Marine of All-Time." My own military career was relatively undistinguished. I never got shot at. I didn't have to shoot at anyone. I didn't even leave the USA. I earned a Good Conduct Medal, some meritorious promotions, and a few Meritorious Masts. Still, I am proud to have served and although I never had to hear a shot fired in anger, I was prepared to go into harm's way if I had been required. And, I have a deep and abiding respect for those who have "seen the elephant." Lately, I have been interviewing job candidates for data analyst and business analyst positions. The other day, I saw a resume which made me want to scream! I call it "borrowed glory" when the candidate includes psuedo accomplishments in a resume, but the real accomplishment was done by someone else. "Worked with" or "Worked on"
One resume I received had nearly 40 of these useless 'accomplishments' listed. And, they weren't made any more impressive by adding opinions in the form of adjectives such as, "collaborated extensively..." and "Worked closely...". Nearly as useless as these verbs are in telling what a candidate has actually done are "served", "coordinated" and "utilized." In contrast with these useless and fluffy filler bullet points, this candidate used good action verbs like "developed", "analyzed", "maintained", "documented", "led", "performed", "created" and "gathered" less than 30 times. To add more to the fluffy-filler of the resume, the candidate included bullets explaining the nature of the projects among the bullets listing the candidate accomplishments. I can only infer that the job seeker thought that volume would make up for lack of quality in the bullet points listed in his resume. Perhaps he thought that the nature of the projects where he was a participant would so impress me that I would perceive him to be so skilled and knowledgeable that I would feel compelled to interview him. And, that in the interview he could wow me enough to overlook the steaming pile of manure that he had served up in his resume. Anyone who has been in the workplace very long knows that every team has participants. A few of those participants are real contributors. And, that in spite of the drag on the team from participants, the contributors manage to actually get the work done and deliver results. Your resume has exactly one purpose, to get you an interview. If it isn't getting interviews for you, then you need to examine it very carefully. 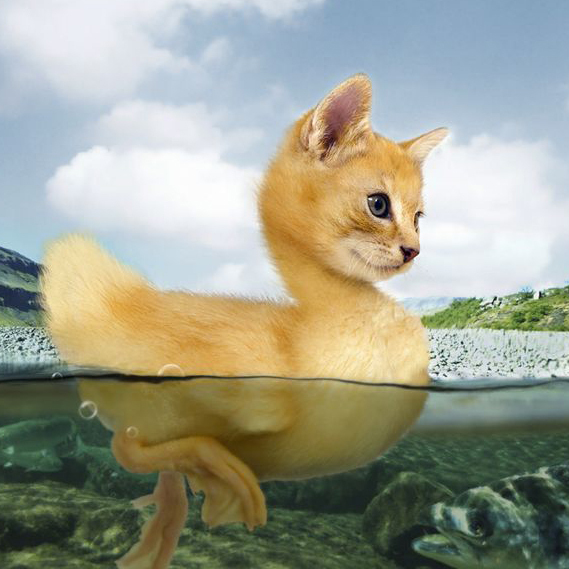 If your resume peppered with pieces of fluffy-filler, get rid of them. They aren't doing you any favors. This candidate never got an interview from me. I wasn't about to waste my time talking to a participant. I am only willing to consider hiring contributors, the people who deliver results. Perhaps I am more critical than many hiring managers. But, do you want to count on that when it comes to getting the job you want? 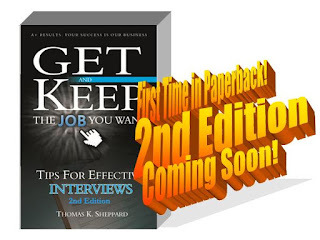 Tom Sheppard is the author of Tips for Effective Resumes: Get and Keep the Job You Want, available as an ebook through Amazon. In addition he has authored a series of books to help job seekers Get and Keep the Job You Want. His books are the results of decades of interviewing, hiring and firing people as well as coaching job seekers, preparing resumes and cover letters. Today, I wanted to share something that seldom happens to me. I got a resume that contained a couple of crazy screw-ups that I have never seen before. In the last few weeks I have been working to fill several roles in my current project team. That means I have, once again, been looking at lots of resumes, doing some phone interviews, and doing even fewer face-to-face interviews (most of those using video conferencing software). In case you aren't aware of my background, you should understand that I have literally seen thousands of resumes. So, when I tell you that this is a first for me, you will hopefully understand how startling that really is. Any decent interviewing coach will tell you, never trash-talk a former employer. When you say bad things about a former employer, the prospective employer immediately is put on guard, wondering what you will say about them when you move on to your next position. Still, sometimes a job candidate will screw up, letting the mouth get ahead of the brain, and say negative things about a former employer. However, I have never heard of a job seeker putting negative things about a former employer in their resume, until today. I started reading this poorly formatted resume (I could waste a whole column on the bad formatting in this resume), wading through it diligently until I hit this phrase, "... groups had open turf wars...". This was followed by another loaded phrase, "... continue without ruining the testing of others...". This last part was embedded in the candidate's accomplishments. I also found the word "harmony" in the situational objectives mentioned in the resume. For just one former employer, this candidate effectively delivered a message that the company had a dysfunctional team that had to bring in this candidate to get everyone to behave like adults working for a common enterprise. The assertion begs the question, now that the candidate is moving on, will the inner-bad-children come out once more and cause the dysfunctional behavior to flourish again? If you aren't getting my point on this, consider what I am saying from another perspective. What would happen to you if you wrote on your FaceBook or LinkedIn page that your current employer had a dysfunctional environment where turf wars were raging? If you don't know what would happen, let me help you out. As soon as your employer found out about your post, they would be very likely to fire you. Some will ask, "why would they fire me if it is a known fact within the company?" The answer is simple. Loyalty. You don't air the family dirty-laundry in public. I know that loyalty has a bit of a bad name right now. And for those who are looking for a job, the word may make you uneasy. But loyalty is as indispensable today as it ever has been, even if its limits are more constrained now than ever before. In the past, loyalty was a two-way street. Employees gave their best to their employer and employers offered decent pay and benefits that may even include a job for life. Now, it's more of a one way street, or at least a much shorter two-way street than it used to be. Today, employees give their best to their employer while they keep looking for the employer and job that they really want, and employers offer what benefits they feel they must to attract employees, while they stand ready to cut benefits and jobs at a moment's notice if it will boost their quarterly returns and keep the shareholders happy. Still, there is a dimension to loyalty that persists and is a two-way street. You don't want your former employer to share all your warts with anyone who will listen, and your employer doesn't want you to share their warts with others. We all know that in private conversations, once trust has been established, warts will get shared. But, we don't expect to see them appear in writing. When this candidate tried to highlight his wart-removal skills, what he actually did was manage to point out the warts of his former employer, and betray their trust. If he had done this in the confidential setting of a job interview, it might have been forgivable. This wart was outed in writing in a resume that could be read by anyone, forwarded to anyone, and possibly seen by thousands. If this resume is posted on a site like Monster.com, the candidate is at risk of being sued for libel by the former employer. In comparison with the total faux pas of outing an employer's warts, the second never-before-seen feature of this candidate's resume pales to almost insignificance. Before this resume, I have never seen a candidate insert in their resume a "personal challenge." Right along with all the experience and accomplishments, the candidate posted a phrase, "Personal Challenge", and then proceeded to list the challenge that this employment opportunity presented to the candidate. It was presented as a question, such as, "Can I ...?" Do you see the insanity of questioning your abilities in the text of your own resume or job interview? Instead of presenting an image of accomplishment in the resume, this personal challenge inserts a question of the candidate's abilities. When a prospective employer reads your resume, they always ask themselves, "can the candidate really deliver this kind of performance for me and my company?" It is a sure way to kill your job prospects for you to question your own abilities in your resume. This job seeker showed he is disloyal and questions his own abilities. Why would anyone want to hire a duplicitous incompetent? Remember, your resume gets the first interview. If it doesn't interview well, you won't get a chance to speak for yourself. This candidate never even got an interview because his resume didn't interview well. (C) Copyright 2016 Thomas K Sheppard and A+ Results LLC. Tom Sheppard is the author of several self-help books for job seekers. 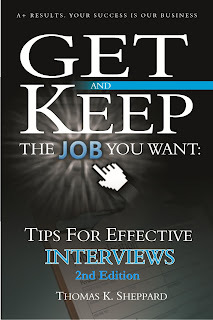 His bookTips for Effective Resumes is available as an ebook through Amazon. 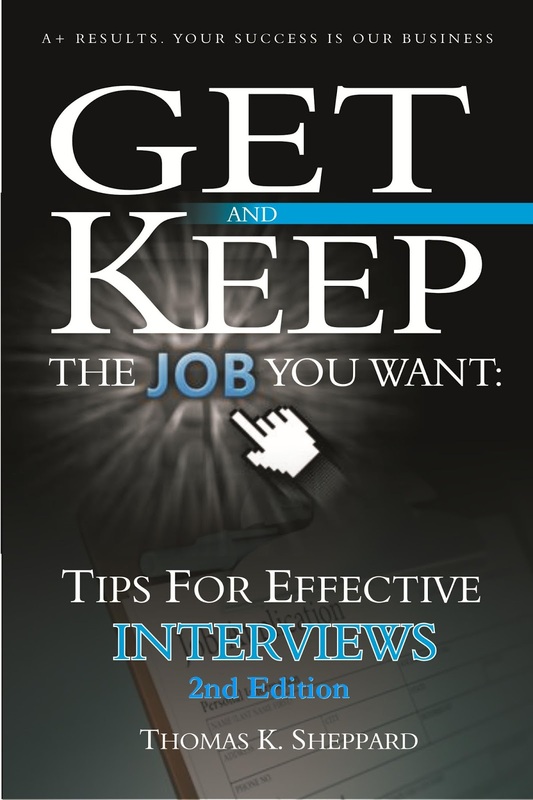 His bookTips for Effective Interviews is in its second edition and is now available in paperback as well as ebook formats. 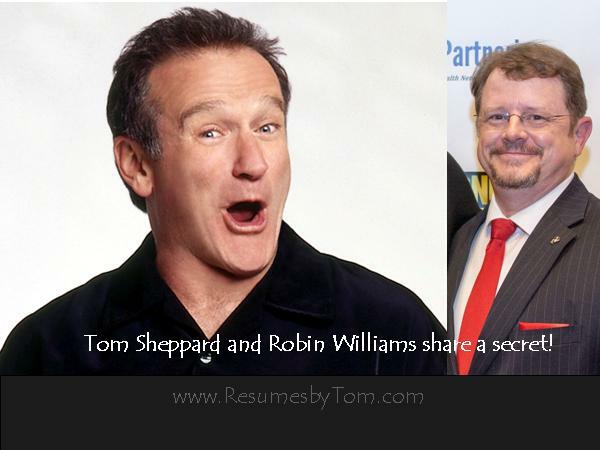 You can learn more about his help for job seekers at his blog www.ResumesByTom.com and from his Amazon Author Page. Why NOW! is the Best Time To Look for a Job! I have some goods news for you and some bad news for you. The good news is that right now, unemployment is the lowest it has been in 10 years. And, that means it is a great time to get a better job - one with better pay or perks, or both. In a recent article in MSN Money, Caroline Baum asks, "Have Businesses Really Run Out of People to Hire?" And Rich Miller of Bloomberg News notes that "It's becoming harder and harder to attract people to do those entry level jobs..."
The Labor Department reported on June 8 that job openings rose to 5.8 million in April from 5.7 million in March. That tied last July’s results as the highest since records began in 2000. Hires, meanwhile, fell to 5.1 million, from 5.3 million. To put this very simply, it means you have 5.1 million people hired out of 5.8 million job openings. And, although 700,000 job openings isn't huge when you spread it all over the country, it still portends a problem for businesses. The bad news is that right now, unemployment is low, and that means that there are other folks out there looking to get a better job. They are competing with you to get the attention of hiring managers so they can get interviewed and to get job offers. Now, you may look at all that I just said, and reply, "So how is now different than any other time I have been looking for a job?" That is an excellent question. And I have some very good answers. First, because unemployment is low, it means that there are more jobs than job seekers. Although this may not be true in a specific industry, it is a reality of the broader market. Getting a job is the first step toward getting the job you want. Having unfilled jobs tends to make hiring managers cranky, and sometimes a bit desperate. One of them might take a chance on you even if you're not the ideal candidate for their job. This means you should feel more confident about applying for jobs where your qualifications may be a bit marginal. Be bold and swing for the fences. Taking a less than ideal job can be the best thing to do for your career. Just because you take a job that isn't really the one you want, it doesn't lock you into that for the rest of your life (or even for a year). If you are currently unemployed, or underemployed, don't be afraid to take a job while you are looking for the job you want. When your ideal employer asks about your current employment situation (which may not even be on your resume), tell them (the truth), "I have temporary employment while I am looking for the sort of role where I can make a greater contribution." If the job you take while looking for the job you want relates to your chosen field, then, by all means, put it on your resume and explain to your prospective employer that you are "exploring areas related to your main area of expertise so that you can broaden your knowledge and experience base in your field." If the current job in no way relates to the job you want, then don't worry about putting it on your resume, although it will end up on any job application you fill out. Not having a job makes it harder to get a job. When a hiring manager interviews you and finds out that you are unemployed, especially in a candidate-scarce job market, the first thing they ask themselves is, "if no one else wants this guy/gal, why should I?" The second thing they ask themselves is, "what is wrong with this candidate if they cannot get a job right now when candidates are scarce and jobs are plenty?" Neither of those are questions you want them asking themselves or anyone else. So, broaden your definition of an acceptable job and take one. Ideally, the job you take will relate to your chosen field. If not, don't despair. Regardless of whether the job you take is unrelated or related to the job you want, being employed lets a prospective employer know that you are employable. That way, they don't ask themselves those two pesky questions I mentioned above. Also, because you already have a job, they assume you aren't desperate. Meaning they cannot safely give you a "take it or leave it" job offer. Because, since you aren't desperate, you can "leave it" and they will still have an unfilled role and the lower productivity that goes along with that. Instead, they want to know what will it take to lure you away from your current position. The lack of desperation on your part gives you more leverage to negotiate. Ask for everything you want, full-time work, benefits, pay, etc. The worst that will happen is they will say "No" and drop you as a candidate. In which case you are no worse off than when you came in the door. The best that will happen is they will give you all or part of what you ask. And that will leave you much better off than when you walked in their door. What Separates Tom Sheppard From Donald Trump? Earlier this month, when both Ted Cruz and John Kasich suspended their bids for the Republican nomination for President, billionaire businessman Donald Trump became the only Republican candidate still pursuing the nomination of the party to run for President of the United States (POTUS). That put me in a very unexpected position with just one degree of separation between me and the man who may be the next POTUS. 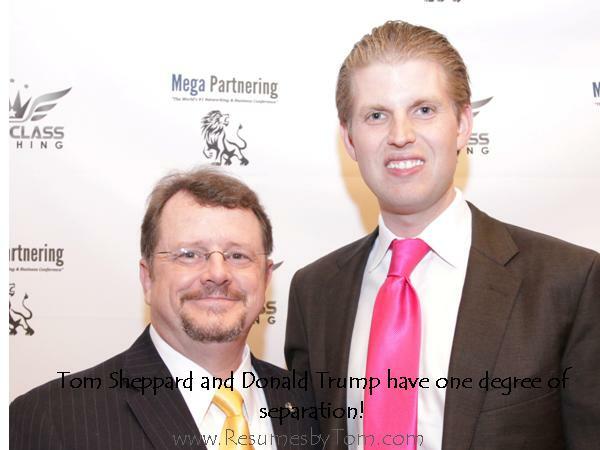 And what separates me from Donald Trump is Donald's son Eric Trump. I have met Eric several time at business conferences where we have shared the stage. Eric has always been there for just one purpose. To make money, not for himself or his father, but for St. Jude's Children's Hospital in New York. From my perspective he has been a tireless supporter of this charity. And, I have personally witnessed him help to raise hundreds of thousands of dollars for the hospital. He raised the money from entrepreneurs and business owners, capitalists. What does all this have to do with you getting and keeping the job you want? When you willingly give your time, your money, or both, to a cause that is bigger than yourself, it makes you a better person. And, being a better person makes you more attractive to potential employers. If all I knew about Eric Trump is that he is the son of Donald Trump, I might make all sorts of erroneous assumptions about the man, his character, and even his father. Having met Eric on several occasions, and seen him in action, I can tell you that he isn't afraid of hard work, and he willingly gives of his time and money to a worthy cause which is bigger than himself. In short, he uses the advantages his name and family give him to help others who cannot repay his help in any way. If I were looking to hire Eric Trump for any position, his charitable work would play a significant role in my consideration. Likewise, when I look at a resume of a potential job candidate and they include references to their volunteer activities, it immediately lets me know that they are not a one-dimensional person. While I realize that some employers believe they want to hire people whose only interest is their work, most a much wiser than that. They realize that the key to employee longevity in any role that is preventing burnout. And, the key to preventing burnout is balance. Volunteer activity helps bring balance. As an individual, it helps you to keep perspective on your own life when you are actively engaged in helping others, whose lives are not as good as your own. Also, your volunteer experience can often give you opportunity to take on responsibilities which are much greater than you have at work. This is one of the best ways to get experience to back up your push to get the job you want. I have heard it said that knowledge is power. And, knowledge shared, is power squared. 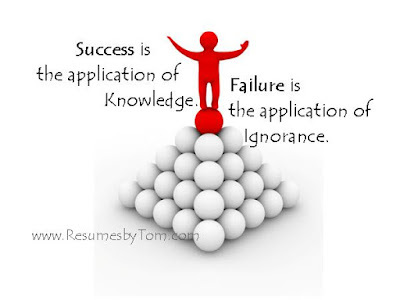 It is impossible to succeed at anything without knowledge. Louis Pasteur is credited with saying that luck is an acronym for Laboring Under Correct Knowledge. Many unsuccessful people look enviously at successful people and say, "she was lucky." Unsuccessful people don't realize how many times that lucky gal failed, and learned from failure, before she gained enough knowledge to succeed. A smart person will learn from their experiences. A truly wise person will learn from the experiences of others. If you don't know how to succeed, learn from someone you know who has succeeded. Pay them to teach you. Trust me, they paid for their knowledge. If you are too poor to pay them with money, then trade them your time and labor for their knowledge. Find out a need they have and fill it. Make yourself valuable to the person you want to learn from. And, give them value before you ever ask for value in return. Why? Because they already know their knowledge is valuable. And if they are wise, they will have learned that if they give you their knowledge for free, you won't place the proper value on it. Then, you will squander the valuable knowledge they have given you by ignoring it. You will have wasted their valuable time. But, when you pay for something, you place a value on it. And the more dear the price you pay, the greater value you will place on that knowledge. Every successful person I know has paid dearly for the knowledge that allowed them to succeed. I don't care if you define success in terms of relationships, inner peace, fame, fitness, things, or all of these, your success will only come through the correct application of knowledge coupled with the effort or price you pay. A friend of mine, Leeza Donatella (Spiritual Spew), enjoys an higher than ordinary level of inner peace than most people I know. For her, part of the price was three weeks of silence and meditation in a painful yoga pose. No success is free. The price may not be exacted in dollars and cents, but the law of exchange is immutable, irrevocable, and inescapable. If you think otherwise, you have some high prices to pay to gain the knowledge you need to succeed. You just paid for this bit of knowledge with your time. Leverage it for your success. PS: If you know someone who is having trouble getting the job they want, tell them to check out www.TipsForEffectiveInterviews.com. It has already changed failure into success for many job seekers. It is filled with powerful knowledge. This St. Patrick's Day, the second edition of my book Tips for Effective Interviews: Get and Keep the Job You Want hit the bookshelves. I am excited about this for several reasons. First, this is the fourth paperback I have published from all my business titles. Ebooks are great, but for me, being a reader from way back, there is something very satisfying about holding a printed and bound copy of a book with my name on it in my hands. The second reason I am so excited about this is because this new edition is so much better than the first edition. I was able to take many of my recent hiring experiences and fold them into the book to add even more value to my readers. Now, before I gush anymore, I want to be totally transparent with you. This is not a big book. It is about 70 pages. And you know what? It is worth its weight in gold! According to Google results, on this Saint Patrick's Day, the price of gold is $1,232.30 per ounce. My book weighs 5.6 ounces. This makes its worth in gold an astounding $6,900.88. Now, suppose you are earning a median income in the US. That is about $43,000 per year. If you use the techniques I teach you in Tips for Effective Interviews, and you get a job earning just 10% more than you earn now, that is an extra $4,300 in income to you in the first year alone. Add in your merit pay increase of 3.5% in the first year ($1,290) and now you are up to $5,590. Now, multiply that number by the number of years you hold that job (let's just say 2), and you are more than $11,000 to the good. All because of investing less than $10 in yourself to learn how to interview right. The power of correct knowledge is really pretty amazing, isn't it? Most people I interview for jobs, don't know how to interview well. Very few of them have invested the time and energy to research how to do it right, and most of the information they get is pretty spotty and some of it is downright wrong. When you add to that mix the fact that most people conducting interviews have never been trained in how to conduct an interview, and you have a perfect storm where unqualified candidates get hired and qualified people like yourself are left thinking that the person who got hired must have had some incriminating evidence on the decision-maker. The good news is that you don't need to be a victim of poorly trained interviewers any more. And, you don't have to be a victim of the lack of solid, proven, reliable information on how to nail an interview every time. Now, with Tips and Tricks for Effective Interviews, you can know how to control the interview and land yourself in the top tier of candidates every time - assuming that you are actually qualified for the job. I do have to add that last disclaimer, because even if you ace the interview and you aren't qualified to do the job, you will probably not last a year in the new role, if they hire you. I confess that this past year, I hired one really bad candidate. I will call her Ms. Mystery. Ms. Mystery had a very strong resume. It was nicely formatted. It had all the right key words. It showcased accomplishments, not just responsibilities. Ms. Mystery interviewed extremely well. Her answers were concise. They showcased her experience. I thought we had a winner. We made an offer and she accepted. Three weeks in it was obvious that there was a problem. She was stressed to tears every day, and she wasn't able to deliver the kind of results that her resume and interview indicated she could. A week later, we let her go. She is still a mystery to me. I don't know how she could have fooled us all so well, unless she had a brilliant job search coach and lied through her teeth. I liked her, but we couldn't carry her. She had to carry her own weight. She had gotten the job she thought she wanted. Unfortunately, she didn't have the skills needed to perform so that she could keep the job she got. That is not a situation I would wish on anyone. It is also not something I can prevent you from doing if you insist on doing that to yourself. And my book, Tips for Effective Interviews is powerful enough to let you get yourself in over your head. So, use it wisely. I have recently had the 'pleasure' of interviewing candidates for positions as project managers on the same contract I am currently working. 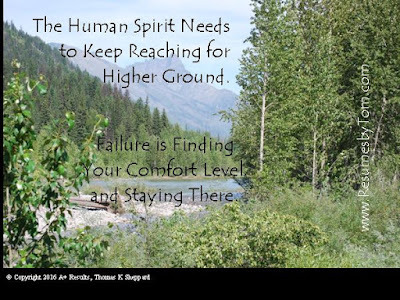 My recent experience demonstrates that in spite of my books and others out there, people continue to mess up their chances for a job by either doing the wrong things or doing the right things the wrong way. I am going to share some real-life, current examples of resume mistakes that prevent job seekers from getting an interview and then some interviewing problems that keep them from getting a job offer. Of course, I have changed the names to protect the guilty. Ms. Mia (or should I say, MIA?) – her most recent experience was left off of the resume. Since her resume was redone on the recruiting company letterhead, I can’t say whose fault this was, but it didn’t help her case. When we asked, are you still with Company XYZ? She had to say, "No. I have been at ABC since 2014." My reaction was, "Oh! Well then, tell me about what you are doing for them?" The bad news about that is that with very limited time for an interview, we chewed up valuable talk-time which could have been avoided if I had seen the position in the resume. Then, I could have asked specifically about anything in that experience that seemed relevant. Unfortunately for Ms. Mia, having the up-to-date resume wouldn’t have made a difference, because Ms. Mia had interviewing skill issues that kept me from moving her to the next round of interviews. Her resume had indicators that she might be qualified for the role, which is why she got the initial interview. Her problem was that during the interview she failed to articulate her answers in ways and words that made it clear that she had actually worked in the same kind of role I was looking to fill. This left me uneasy and without a clear understanding of her skill set. Mr. Nickels – After looking at his resume, I wouldn’t consider him for this role. He had PM experience but not at the right level. His budgets were $1.5mm to $2mm. This is not comparable to the $10mm+ level of experience/impact/seasoning that is needed for a PM in where I am working right now. In this case, Mr. Nickels didn't do anything wrong. His resume gave me the numbers I needed to know that he would not be a good fit. I know from situations where it has occurred that hiring a person into a role that is too far above their skill set level is bad for everyone. I remember the first time I experienced this. In spite of my reservations (which was really just a gut feel which I couldn't clearly articulate), my teammates decided to hire a new team member. Within weeks (literally less than a month) she began to fail because her skills were a match in type, but not in level for the job. She protested that she could bring in her deliverables in three months, not the three weeks the timeline called for. All the rest of the team members could meet those deliverables in that schedule, because their game was that much better (higher level) than hers. We had to manage her out, which is a painful HR nightmare for everyone involved. And it is one I am not eager to repeat. The woman in question suffered financially and emotionally from the process and our team suffered from the lost productivity and missed client expectations from her sub-level performance. So, I learned how to match both skill set and level of skill to positions. I also learned how to discern it in resumes and uncover it in interviews. Mr. Fantastic – I might have interviewed him based on his resume. But if his “multi-million dollar … complex healthcare systems” project listed in his most recent experience turned out to have a budget of less than $10mm, I would have wanted to end the interview right then. What really kept me from wanting to interview him was his liberal use of hyperbole in his resume. He had “Excellent” skills – excellent compared to what – a shoe shine boy? He had a “razor sharp focus.” Is anyone going to confess to being unfocused in a resume? He would “skillfully apply” – would any candidate note a skill in their resume that they applied clumsily? He was “highly effective.” How high is up? Is highly effective delivering an ROI of 500% or 5%? I guess that depends on if the project cost was $5 or $50 million. A 500% ROI on a $5 investment means you turned $5 into $25. And although 5% on $50 million means $2.5 million, it also means that the payback period is 10 years. I suggest you purge your resume of these kind of adjectives and adverbs. They convey ego, not facts. 1) Your resume summary or skills list mentions a skill set, but your resume experience (and maybe your actual experience) does not reflect any role where you actually had to work in roles that required that as a primary skill set. o Their resume experience does not reflect experiences where they had to display key PM skills such as project planning, risk management, issue escalation, stakeholder management, etc. Often this happens because they held roles that may give them some PM skills, but it is not the same as actually having the PM role. Many of these are people who were asked to act as the PM while also working as an individual contributor in the project. Experience has shown that people in this situation are exposed to PM deliverables and skills, but have not had the opportunity to develop those skills to the level required to manage a project of significant size and complexity. They are an entry level PM, at best. 2) Your resume lists skills as “responsibilities”, but doesn't contain any “accomplishments” that reflect those skills. Providing a list of responsibilities without accomplishments that relate to those responsibilities may be read as you were responsible for a lot of things, but didn't do them, and that is why you are now looking for a new job. Resumes that are laced with "excellent skills" often lack cold, hard facts. Facts and numbers tend to tell their own story and often your willingness to put out your numbers for all the world to see suggests a level of confidence and self-awareness that is too frequently missing in job applicants. I suggest that you put cold, hard numbers into your resume wherever possible. Okay, if you managed to avoid those resume pitfalls and you actually got an appointment for an interview, now, you need to do a few things to nail it in the interview. When you are asked a question in the interview make sure you answer it in less than five minutes. If you cannot give a clear and concise answer in five minutes, then you haven't practiced your answers. If you don't think you can practice your answers, then you haven't given enough thought to what you have actually done in your career. If you are unable to quickly and clearly cite specific experiences that answer interview questions your actual experience will remain unknown and you are unlikely to progress to an offer. Consider your answers carefully and listen to the questions you are asked. Even when asked a hypothetical question (e.g., “how would you …?”), instead of saying what you would do, you should respond by pointing to a specific instance in your experience where you handled this kind of situation. You should explain the situation, what you did, and what resulted from your actions. Even for interviewers who habitually ask these (in my opinion worthless) hypothetical questions, answers that highlight actual experience over theory are more impactful. Hypothetical questions and hypothetical answers are, in my view, only useful when interviewing an entry-level candidate. Unfortunately, many interviewers have never received good training in how to interview in ways that allows them to uncover the relevant experience a candidate has to offer, so these hypothetical questions are very common. When a candidate tells me what they “would do” or “typically do” (the latter is slightly better), they are talking theory rather than experience. They might be using Google while on the phone to scan the highpoints from an online article to answer the question, or they may be relying on what they learned in a class. In either of those instances, they are talking theory because they have never actually done it. When the candidate says what they “typically do”, that is a stronger response, but it still lacks the validation that comes from telling about a relevant experience and what they actually did do. Avoid using “we-speak”. You should be very clear to delineate what the team (“we”) was asked to do, and what you (“I”) did. I know that we are all indoctrinated in team mentality and not hogging glory, but you are being hired, not the team.